Note that you're allowed to put more than one ball in each pan. Suppose you are given eight balls and you know that one ball is slightly heavier than all the others, which are of equal weight. You're also given a balancing scale with which you can compare the weight of balls by putting some in one pan and some in the other. What's the minimum number of weighings you need to establish which ball is the heavier one? Its two. But you could have 9 balls. Divide the balls in 3 groups of 3 balls. You compare the weight 2 of the groups. Now you known the group where the heavy ball is. You pick two balls from this group and compare them, you now know wich ball is heavier. Harder. You have 9 balls and one has a different weight, with three weighings you can get which ball is the different ball. With 3 weighings you can find one ball out of a total of 12 balls that are all of the same weight except one, and in addition determining whether the odd one is lighter or heavier than the other 11. Similarly with 4 weighings you can solve the problem with 38 balls, 5 weighings for 118 balls, etc. More generally one can deduce a formula for the number f(n) of balls for n weighings, where n is any positive integer. I think 3 weightings at most, possibly 2. 1. 4 balls on the left-hand side of the scale, 4 on the right, to determine which group of 4 has the heavier ball. 2. Of those 4 which we know has the heavier ball, divide 2/2 between right/left sides of the scale to find which has the heavier. 3. Repeat with 1/1 to find which is heaviest. I'm hoping there's a more clever way where in step 2 you could put 1 on the left and 2 on the right to finagle the heavier ball out of 3 segments (1 left, 2 right, 1 not weighed), but I can't think of it. It's one. Weigh one ball on each side. If you're trying to do this in the smallest number possible, we'll, you weigh the two, one is heavier and you're done. It's only got a 25% chance of working but it's the still the minimum. Just pick a ball, but you have only12.5% chances to get right. Alright...8 balls....1 scale. 8 plus 1....47!!! I think the answer is one. But I'm skeptical because it seemed to easy of an answer. 8 balls - 1 scale ... 47! This is an oft used puzzle where the N of balls changes or you're asked to find the lighter or heavier ball. In this case, the "easy" answer is 3 weighings. You're guaranteed to find it with 8 balls. 4v4. Then 2v2. Then 1v1. But you can actually do it in 2 weighings. You do 3v3 and leave 2 balls unweighed. If side a is heavier, weigh 2 of the balls. If the scale balances the third ball is heavier. If it doesn't balance the heavier side contains the heavier ball. Same if side b is heavier. 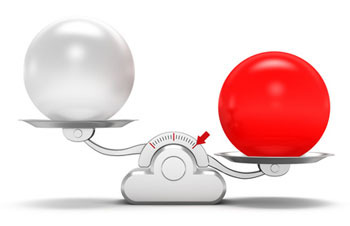 If the scale balances then just weigh the two remaining balls against each other. It's a divide and conquer one. I liked the one here below, with a little twist. weigh 3v3 and leave 3, if one side weigh 2 of the 3 against each other if they weigh the same the third one is heavier if one side is heavier that one is the heavier ball. if they weigh the same do the same process you would do for if you had one side being except you would do it for the ones you didn't weigh. I want it to be three, winnowing down from four balls on each side, to two, to one. But there is no requirement to weigh all the balls at once, so if you only weigh two on each side, you have a 50% chance of being able to find the heaviest ball in only two weighings and 50% chance of finding it in three. So by further application, you have a one in four chance of finding the heaviest ball with only one weighing, and a maximum of four, by placing only one ball on each side at a time. Thus the minimum turns out to be one. My solution is two weighings. 1. 3 balls in each pan. 2. If the first weighing balances then weigh the remaing two. If they don't balance then weigh any two from the heavier pan. If they balance then it is the other ball that is the heaviest. 3 v3 with 2 aside. This will confirm which group the odd ball is in. Once confirmed balance 2 more from that group, which will show directly or indirectly which the odd ball out is. The minimum number of weighings in two. In the first one, three balls are put on both sides of the balancing scale. If one side is heavier, two of the three balls are weight (one one each side). If none of these balls is heavier the ball of the three that was not weight is the heavier one. If in the first weigh both sides have equal weight the two remaining balls are weight and the heavier one is found. I think 3 is the correct answer. Four balls in each pan will show which group has the heavy ball. Split this group between the two pans (two in each). Note which pan (left or right) is low and thus contains the heavy ball. Take one ball from the left pan with your left hand and one from the right with your right hand. This continues on the comment I submitted yesterday on the ball weighing problem. We have f(3) = 12, f(4) = 38, f(5) = 118, f(6) = 360, etc. The solution for the n problem is to leave f(n -1) balls untouched, divide the rest into 2 piles and put one pile to each side of the balance. If the balance balances, then the odd ball is in the untouched f(n - 1) balls and the problem reduces to the one of f(n-1) balls. 1. If the scale now balances, then the odd ball is among the 3^(n-1) ones and we know whether it is heavier or lighter. Then we can find it out in n-2 tries (see below). 2. If the scale tips to change, then the oddball is among the 3^(n-1) moved across the scale and we can again find it out in n-2 tries. 3. If the scale remains the same and does not tip, then the oddball is among the unmoved ones. Then we repeat the above process by further moving f(n-2) balls. The solution relies on the fact that if one knows the oddball is heavier or lighter, then one can find it in 1 try for 3 balls, in 2 tries for 3^2=9 balls, etc. and in n-2 tries in 3^(n-1) balls as asserted in the above. balances, then compare 3 of the remaining 4 with 3 of the known good ones. If scale unbalances, then move 3 across the scale and replace the moved 3 by 3 of the known good ones. Watch the scale and the rest is easy. For 38 balls, place 13 on each side, etc. It is two for sure. You just have to divide the given balls into groups of three, three and two balls. Try it out, it you will find out.